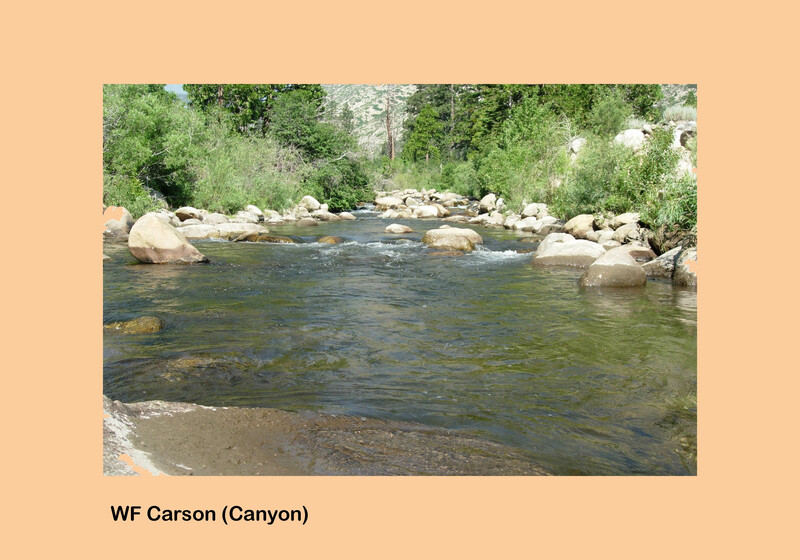 Directions: You can reach WF Carson Canyon by way of Hwy 88 west from Hwy 395, 17 miles out of Gardnerville. 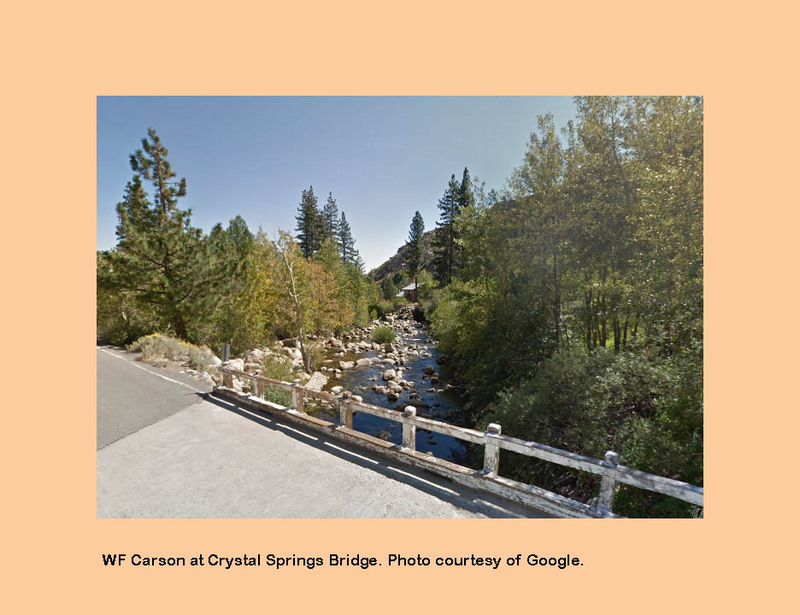 You will pass by the village of Woodford and the WF Carson River within the Carson Canyon extends another 9 miles. The canyon ends at Sorenson's Resort and the Hope Valley extends another 10 miles. 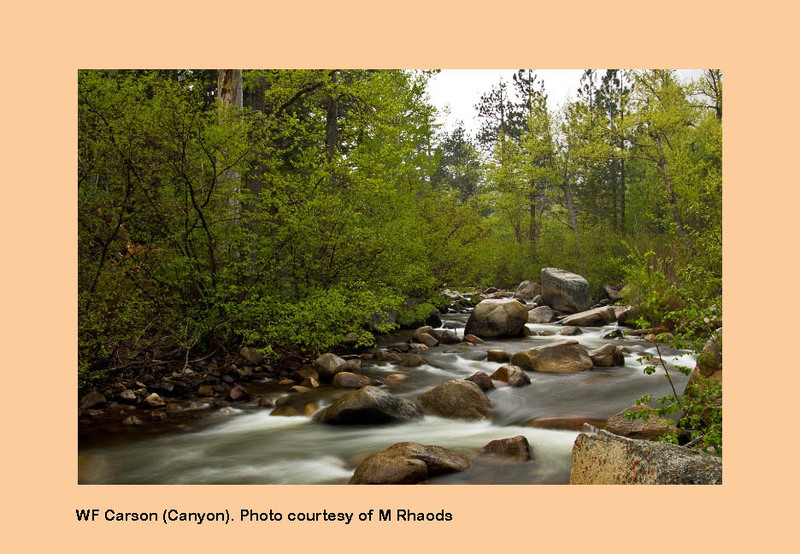 You can also reach the Carson Canyon by Hwy 89 south from South Lake Tahoe. This route is about 25 miles. The West Fork of the Carson River starts as a small tributary near Upper Blue Lake and flows northward through the Hope Valley for 26 miles until it hits Nevada. 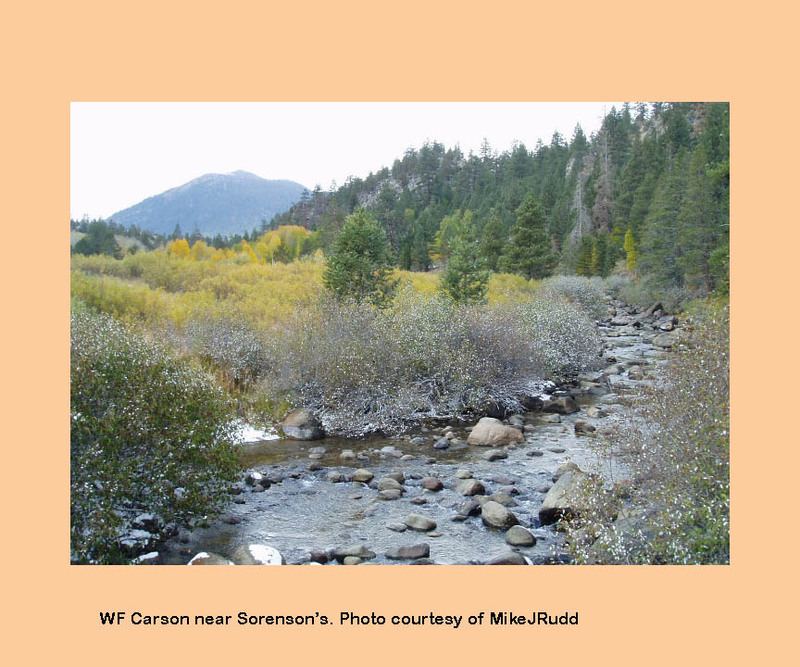 The Carson Canyon starts near Sorenson's and extends for about 9 miles until it opens within Alpine Village. Most of the fish in this section are rainbows and browns in the 8-12 inch class. The river becomes larger and more heavily fished for the 7 miles leading to the town of Woodfords. This section of the river is stocked weekly during the early Summer with rainbows by CDFW and the Alpine County Fish and Game Commission. Alpine County will plant about 15,000 lbs during the season with some trophy sized Rainbows in the 5-7 lb. class. The planting schedule continues until the flows are too low or the water temps become too high. 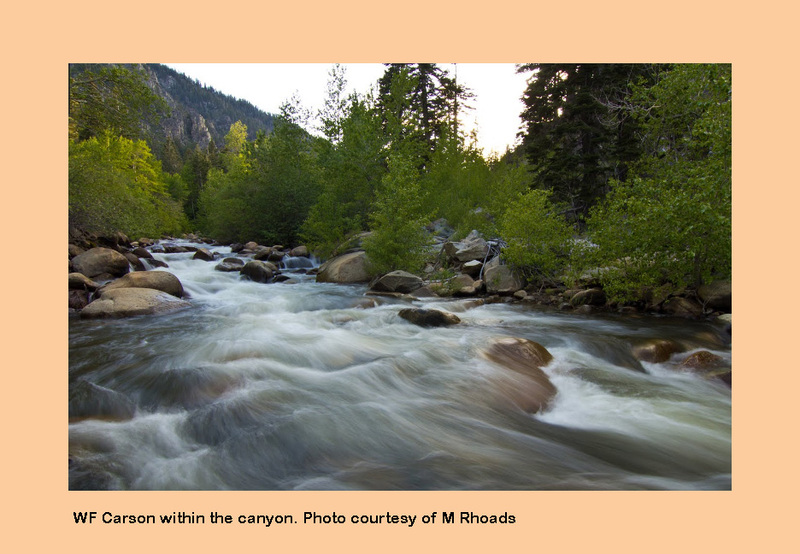 The West Carson Canyon flows with riffles, runs, and pocket water. The large pools tend to hold the planted trout while the runs and pocket waters will hold the wild rainbows and browns. This area is a good choice during the late morning when temps get too warm to fish Hope Valley. Out of Woodfords access is restricted due to private property but some access is available from Carson River Road which follows the river east of Hwy 88 towards the Nevada Border. Flows range from 25 to 250 cfs. The best fishing flows are 50-150 cfs. Check the above link for Current conditions. A Fly Shop resides within Sorenson's Resort called Horse Feathers. This shop is owned and operated by Judy Warren-Wickwire. Judy provides fly fishing lessons as well as casting clinics within the local Beaver ponds. Judy has also authored two guidebooks about the local fishing. Sorenson's provides cabins and a cafe. 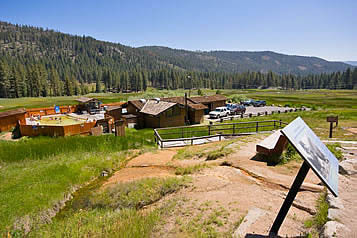 There is a campground next to Sorenson's called Hope Valley Resort. Sorenson's also provides numerous events with an Emigrant Trail tour and seminars on Outdoor Photography, Medicinal Plants, Geology, Alpine Wildflowers, and a Fall Color hike which showcases the local Aspen tree groves. The area has a rich history with the Pony Express Trail and the Mormon-Emigrant Trail nearby. A Wildlife Reserve area of about 2,900 acres resides within the Valley home to Mule Deer, Black Bear, Bobcat, Blue Grouse, Northern Goshawk, and Clark's nutcracker. Covers the West Fork Carson River from Nevada Border through Hope Valley. Topographic relief showing features surrounding the river. Shows camping areas, GPS Long./Lat., road access, trails, and property boundaries. 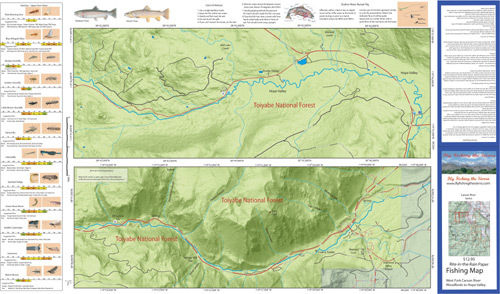 Special Features are the Hatch Chart, Fishing Season and Regulations, Fish Identification, Historical Flow Chart, Nymphing Rigs, and Stream Etiquette guidelines. Printed on Rite-in-the-Rain Paper that will allow you to write those special notes. Waterproof and Durable.